Liebherr’s new crawler crane, the LR 1800-1.0, has proved its strength by hoisting a 560t test load, as part of the prototype testing procedure. The new crawler crane managed the test load on its 84m main boom with derrick system with a radius of 12m. HSLDBV is the name of the boom system on the LR 1800-1.0, which underwent the test. It consists of the particularly powerful main boom (HSL), the derrick system (D) and the new suspended ballast with adjustable frame, the “V frame” (BV). The V frame is a hydraulically adjustable ballast system that enables enormous adjustment distances with a ballast radius of between 14 and 23m. It delivers maximum flexibility compared to the standard rigid system for large ballast radii. For the first time the boom system features lattice sections with three system dimensions which can be telescoped into each other for transport. Another feature which reduces transport costs is that the basic machine is designed with a 3m transport width and a maximum transport weight of 45t. The weight of the crawler travel gear of 60t can be reduced to a transport weight of less than 45t by removing the tracks. To hoist the test load, 400t of suspended ballast were extended to the maximum radius of 23m. The crane was also equipped with 170t of ballast on the slewing platform and 70t of central ballast. Over the next few weeks, Liebherr’s crane acceptance staff will test the new LR 1800-1.0 with even heavier loads. 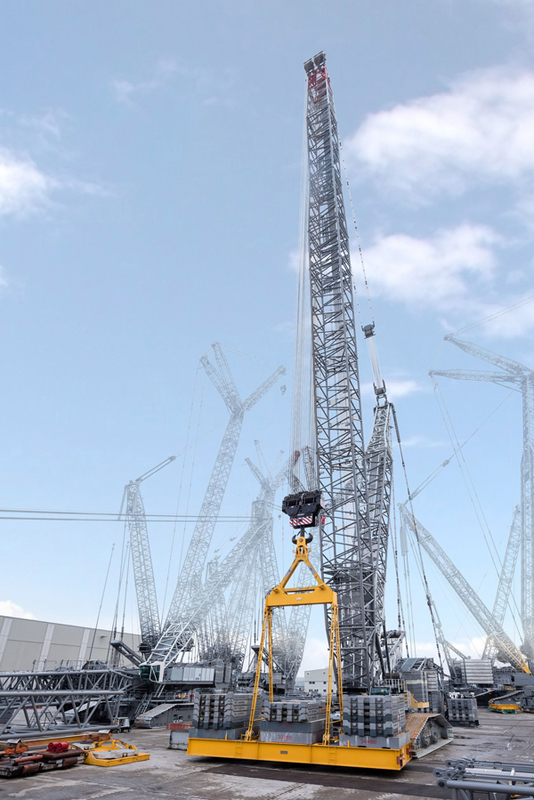 The tests will be almost complete by the time the Bauma opens its doors in Munich, where the crane will be one of the highlights on Liebherr’s trade show stand.